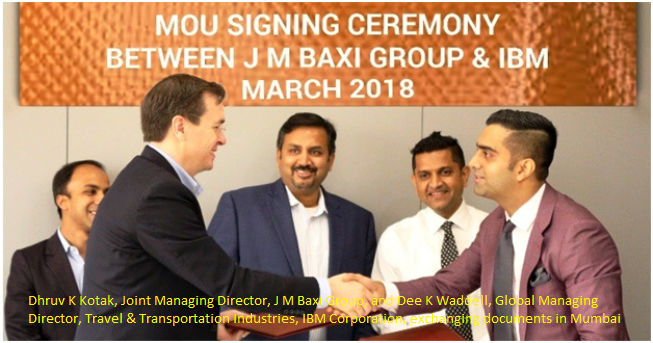 Privately-run logistics conglomerate J M Baxi Group is teaming up with IBM in a digital push to help the company expand in newer areas of business, transform their internal processes and jointly develop technology-led solutions and offerings leveraging IBM Blockchain, says a release. The two parties signed a memorandum of understanding in Mumbai to collaborate on multiple projects by bringing the joint expertise in domain knowledge, techno-functional expertise, and technology expertise to solve business problems afflicting the EXIM trade and logistics industry. Under the arrangement, both organisations shall jointly set up a Technology and Innovation Council to leverage the best of IBM�s technology expertise and J M Baxi group's industry expertise to incubate new ideas to jointly build next generation of client solutions. As per media reports, the council would conduct feasibility studies and projects on blockchain, enterprise data architecture and Artificial Intelligence (AI) using IBM Watson services. Mumbai-based JM Baxi Group runs ships, port terminals, inland container depots (ICD) and provides customs broking and marine services.